By now, if you’re not a GoogleDocs convert, you at least know enough about it to resist it’s Google-y charms. If you fall into the latter group, well, you might just come around by the end of this post. Nestled among Google’s answer to the trifecta of productivity software is a gem that will make registration for your next library workshop a breeze, especially when used with Google Calendar. 1. 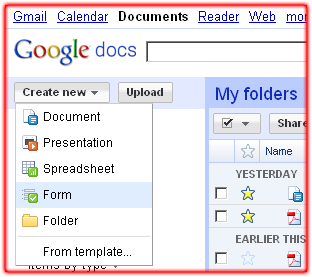 Create a new Form from the GoogleDocs front page. 2. Add a name and a description for your event. 4. I like to edit the confirmation message – the note students get when the form is submitted. Do this under More Actions. 5. Also under More Actions, select Embed and copy the code for your form. Now you can add the code to a web page, but why stop there? Go a step further and paste it into the description field of an event in Google Calendar. The trick here is to tweak the HTML a little to make a link instead of an embedded object. I just change the <iframe src> tag to an <a href> tag and edit what I want the link to say. Finally, take the code for the Google Calendar and paste it into your website. This code can be found in Calendar Settings for the desired calendar. Now, you have a fully integrated library events calendar and sign up sheet. 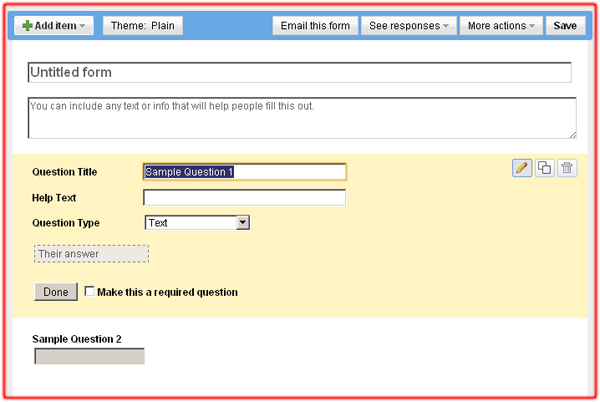 When participants fill out the form, their responses will be added to a spreadsheet in your GoogleDocs item list. 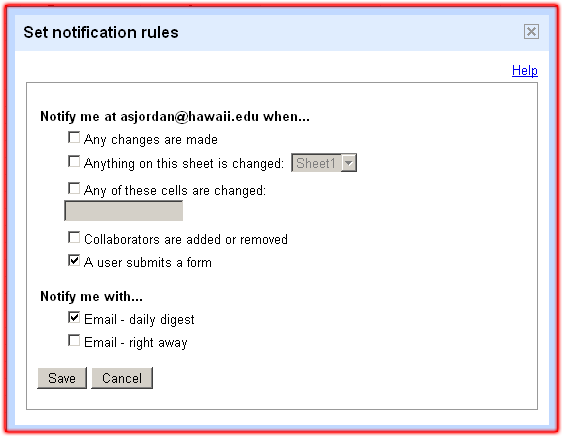 One last detail I like to customize, is notification – you can be sent an email when someone submits the online form. To set this up, open the spreadsheet, go to Tools → Notification Rules. 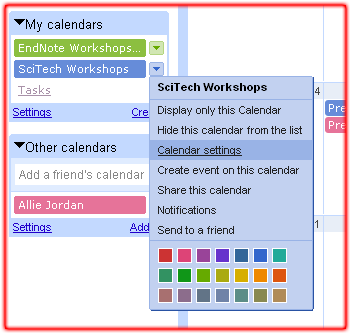 This GoogleDocs/Calendar combination has been immensely helpful in setting up workshop registration and keeping attendees organized. Plus, it has all the benefits that come with GoogleDocs – it’s web-based so I can set up registration forms anywhere and I can add co-instructors who can view the class list and make any needed edits. To see all this in action, feel free to check out my workshop calendar. Allie Jordan is the Emerging Technologies and Instructional Services Librarian at the University of Hawaii at Manoa. While she’s not exploring the ins and outs of the graduate student psyche, she’s cross stitching or watching roller derby. Where can I locate your rss feed? I can’t find it anywhere. I’d like to follow more of your posts. We’re doing this too! We went live with a Google calendar and Google program registration a few weeks ago. I’ve been trying to do this for awhile, but when I embed the link into my calendar, it changes from code to text. What am I doing wrong? Hi Jess, You’re not doing anything wrong – when creating the calendar event, once you click Save, any HTML will revert to text only. The link should be in the public view of the calendar, but when you go back into the event as an editor, it will appear as text. I just make sure to edit all the HTML before I save, then go to the public view of the calendar to double check any links. If anything in the description is incorrect, I just delete what’s there and start from scratch. I’m wondering if in doing events this way, can you limit the number of guests, then display when an event is full? You can limit the number manually. You can advertise that you’re accepting x number of people, and then use the date & time stamp in the spreadsheet to see who signed up first. When our storytimes were full we removed the link from the website and added a note that it was full. Great answer Laura! That’s exactly what I do for my library workshops. Since I embed the calendar into the workshop page, I edit the name of the event to say “CLOSED” or something similar. Also, in the spreadsheet for the event, I go to Form –> Accepting Responses to turn off the form. When people try to submit a form they get an error message. Thanks for this great tip. I am going to try and implement it for the programs we offer that require registration (just a few of ours require it). Right now people must either call or register in-person. This allows another convenient, 24X7 option. I also appreciate the comments on how to limit signups. Very good to know. Love this!! I am running into a problem with the code changing underneath the text so the <a href= part is removed when it gets to the calendar that it is embedded on the web site. Any ideas? Hi Jennifer, if I’m understanding correctly, it sounds like you’re having the same problem another reader, Jess, did. Check out her comment from April 30 and the two replies. Hope that helps! Do you know if there is a way to have the person added to the calendar event after completing the form? And is there a way to only have the form available in order for them to attend an event? Hi there! Regarding your first question, I haven’t tried this but from my experience, you’d have to add the person to the event manually. As for the second, if I’m understanding correctly, you can embed the form anywhere (not just in a calendar event) by grabbing the code as in step 5 or in the spreadsheet view, go to Form –> Embed Form In a Webpage. Thanks for keeping up on these questions! Your post has been our most popular post to date! Hmm, the limiting registration manually doesn’t seem like a good solution to me. If there’s high demand and I’m not at my computer, I could return and find tons of people registered that I’ll then have to notify and apologize to. That’s not good public relations, and thus the Google Forms option doesn’t seem like a real solution for registrations that require a cap on attendees. Your post was exactly what I was looking for. Thanks a bunch. Let me know when Google lets you embed the form right in the details. =) Thanks again. Is there anyway to include information about the specific event in the form / response email. I am thinking about using this for registration of classes, and it would be good to have the information on the class (Title / Date) rather than have separate forms for each class. I’m in the same position as Kristofer where manual editing is pretty much a showstopper. Is there any way to have this automated? Also, is there a way to have the number of available seats listed on the registration form? when I copy the form embed link to the body of the calendar event, I have only Loading…. text and the form doesn’t appear inside the Calendar.